A big victory for water activists is here as Slovenia has amended its constitution to make access to drinkable water a fundamental right for all citizens and stop it being commercialised. This is what happens when campaignrs have the necessary tools such as citizens evoked referendums to implement the will of the people. Congrats Slovenia! Everyone has the right to drinking water. Water sources are public good managed by the state. Water resources serve primarily as the sustainable supply of drinking water and water for households and in this part are not treated as a commodity that can be traded with. Drinking water supplied to the public and to households is provided by the state through local communities direct and non-profit. Last night the Parliament held the voting. With 64 votes in favour and none against, the 90-seat parliament added an article to the EU country’s constitution saying “everyone has the right to drinkable water”. The centre-right opposition Slovenian Democratic party (SDS) abstained from the vote saying the amendment was not necessary and only aimed at increasing public support. Slovenia is a mountainous, water-rich country with more than half its territory covered by forest. “Water resources represent a public good that is managed by the state. Water resources are primary and durably used to supply citizens with potable water and households with water and, in this sense, are not a market commodity,” the article reads. The centre-left prime minister, Miro Cerar, had urged lawmakers to pass the bill saying the country of two million people should “protect water – the 21st century’s liquid gold – at the highest legal level”. “Slovenian water has very good quality and, because of its value, in the future it will certainly be the target of foreign countries and international corporations’ appetites.“As it will gradually become a more valuable commodity in the future, pressure over it will increase and we must not give in,” Cerar said. Slovenia is the first European Union country to include the right to water in its constitution, although according to Rampedre (the online Permanent World Report on the Right to Water) 15 other countries across the world had already done so. Last night the National Assembly of Slovenia passed an amendment to its Constitution to include a new article that recognizes the Human Right to Water. The amendment affirms water should be treated as a public good managed by the state, not as a commodity, and that drinking water must be supplied by the public sector in a non-for-profit basis. 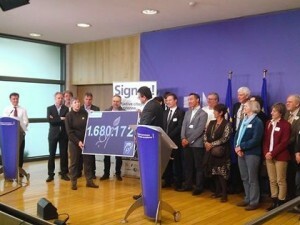 It is a great success for Slovenian activists and people. 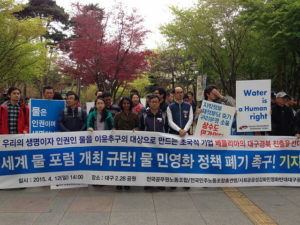 “Citizens from across the EU and Europe have successfully mobilized to have the right to water and sanitation recognized as a human right – as decided by the United Nations – and have this put into EU law. The European Commission continues to ignore nearly two million voices of the first ever successful European Citizens Initiative. Commissioner Vella should listen to citizens and follow the Slovenian example as soon as possible,” said Jan Willem Goudriaan, EPSU General Secretary. Water is a controversial topic in Slovenia, as foreign companies from the food and beverage industry are buying rights to a large amount of local water resources. 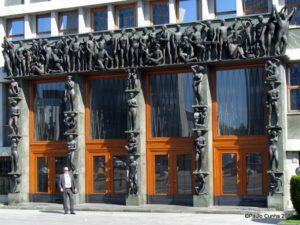 The Slovenian government has raised concerns about the impacts of free trade agreements like CETA in its capacity to control and regulate these resources . “Trade agreements and investor-state dispute settlement mechanisms can limit the ability of states to take back public control over water resources when foreign investors are involved, as it is the case in Slovenia. To guarantee the right to water and the control over this key resource, the European and the Slovenian Parliaments should reject CETA when it comes to a vote in the coming months,” said David Sánchez, Director of Food & Water Europe. The amendment is the result of a citizens’ initiative that collected 51.000 signatures to propose a constitutional amendment . “We welcome the introduction of the human right to water in the Slovenian constitution, as the great result of a citizens’ initiative. 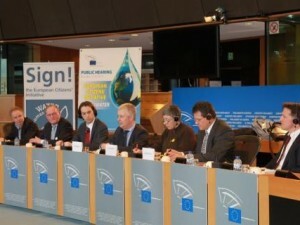 Now civil society should be vigilant to guarantee a democratic and transparent management of the integrated water cycle founded in the participation of citizens and workers,” said Jutta Schütz, speakperson at the European Water Movement. 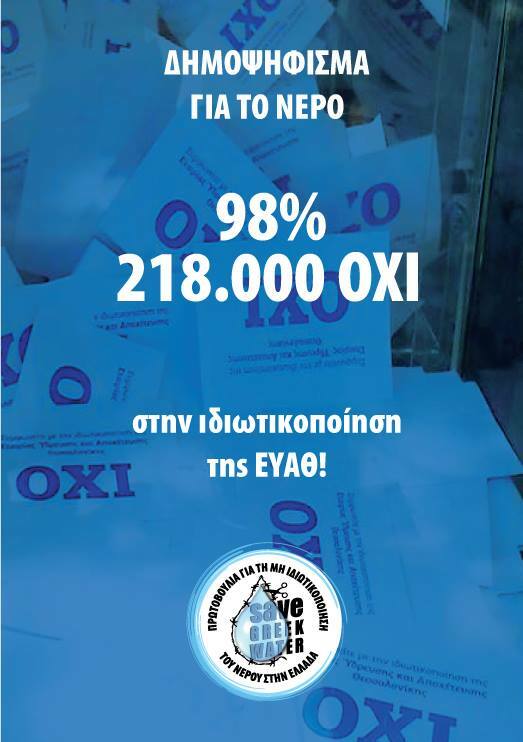 SAVEGREEKWATER is a member of the European Water Movement since 2012.